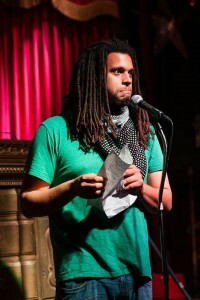 Chicago/Bay poet Tim Toaster Henderson. Photo by Ian Tuttle. Toaster is a performance poet who has competed in the Individual World Poetry Slam, National Poetry Slam, Ink Slam and other “big money” poetry competitions. He has also performed in a large variety of literary showcases such as Literary Death Match, The Encyclopedia Show, Lit Quake and Beast Crawl. Toaster was featured in SF Weekly, on All Def Digital’s youtube channel and Season 4 of Lexus Verses and Flow. You can find his work on his website, his Instagram, and his Twitter. Tonight also marks the final night in our current 8×8 poetry slam series! Eight slam winners will slam off for the season championship and the opportunity to slam against August’s Season Champion, Mckendy Fils-Aimé, to fill the vacant Champion of Champions post.